Antarctica: an extraordinary continent of awesome beauty. It is also home to an isolated outpost where a discovery full of scientific possibility becomes a mission of survival when an alien is unearthed by a crew of international scientists. The shape-shifting creature, accidentally unleashed at this marooned colony, has the ability to turn itself into a perfect replica of any living being. It can look just like you or me, but inside, it remains inhuman. In the thriller The Thing, paranoia spreads like an epidemic among a group of researchers as they're infected, one by one, by a mystery from another planet. Paleontologist Kate Lloyd (Mary Elizabeth Winstead) has traveled to the desolate region for the expedition of her lifetime. Joining a Norwegian scientific team that has stumbled across an extraterrestrial ship buried in the ice, she discovers an organism that seems to have died in the crash eons ago. But it is about to wake up. When a simple experiment frees the alien from its frozen prison, Kate must join the crew's pilot, Carter (Joel Edgerton), to keep it from killing them off one at a time. And in this vast, intense land, a parasite that can mimic anything it touches will pit human against human as it tries to survive and flourish. 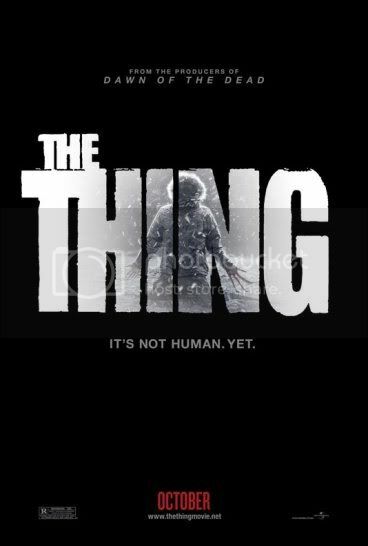 The Thing serves as a prelude to John Carpenter's classic 1982 film of the same name. Directed by Matthijs van Heijningen, the thriller is produced by Strike Entertainment's Marc Abraham and Eric Newman (Dawn of the Dead). При научно изследване в Антарктида са открити форми на извънземен живот. Находката предизвиква бурни разногласия между студентката Кейт Лойд и ученият д-р Сандер Халворсън. Специалистът, иска сам да изследва откритието, докато Кейт се обръща за помощ към своя приятел Сам, за да й помогне за доказване на съществуването на извънземни. Филмът е дебют за холандеца Матиас ван Хайнинген, който разполага с бюджет от 35 милиона долара, за да убеди зрителите, че извънземните съществуват. Всичките ми познати го нахраниха = или е пълна тъпня или най-добрия филм на декадата. съгласен съм с deadface -филмът си е доста добър за нов Определено не съжалявам, че го гледах.